"Numerous human rights observers have raised concerns about increased police brutality in the U.S. in the wake of the September 11, 2001 attacks on the World Trade Center. An extensive report prepared for the United Nations Human Rights Committee tabled in 2006 states that in the United States, the 'War on Terror has 'created a generalized climate of impunity for law enforcement officers, and contributed to the erosion of what few accountability mechanisms exist for civilian control over law enforcement agencies. 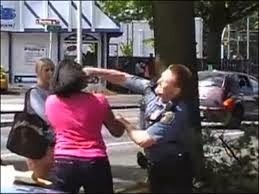 As a result, police brutality and abuse persist unabated and undeterred across the country." "While the prevalence of police brutality in the United States is not comprehensively documented, statistics on police brutality are much less available. 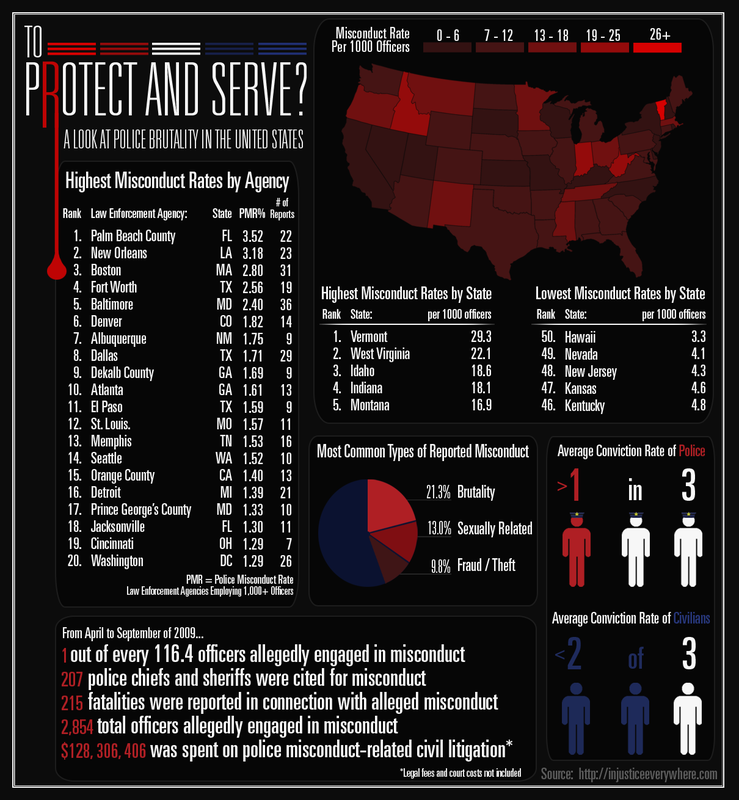 The few statistics that exist include a 2006 Department of Justice report, which showed that out of 26,556 citizen complaints made in 2002 about excessive use of police force among large U.S. agencies (representing 5% of agencies and 59% of officers), about 2000 were found to have merit. "Statistics on the use of physical force by law enforcement are available. For example, an extensive U.S. Department of Justice report on police use of force released in 2001 indicated that in 1999, 'approximately 422,000 people 16 years old and older were estimated to have had contact with police in which force or the threat of force was used.' Research shows that measures of the presence of black and Hispanic people and majority/minority income inequality are related positively to average annual civil rights criminal complaints. "Police brutality can be associated with racial profiling. Differences in race, religion, politics, or socioeconomic status often exist between police and the citizenry. Some police officers may view the population (or a particular subset thereof) as generally deserving of punishment. Portions of the population may perceive the police to be oppressors. In addition, there is a perception that victims of police brutality often belong to relatively powerless groups, such as minorities, the young, and the poor. A 1968 study in three large cities indicated that police brutality was 'far from rare,' and that the most likely victim was a 'lower-class' man of either race. "Recent Amnesty International and Human Rights Watch reports confirm that prison guard brutality is common in the U.S. A 2006 Human Rights Watch report revealed that five state prison systems permit the use of aggressive, unmuzzled dogs on prisoners as part of cell removal procedures. 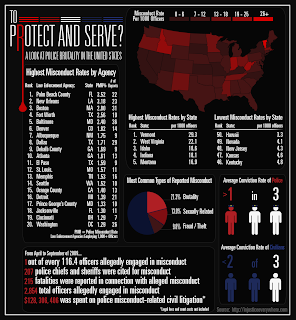 "In the United States, investigation of cases of police brutality has often been left to internal police commissions and/or district attorneys (DAs). Internal police commissions have often been criticized for a lack of accountability and for bias favoring officers, as they frequently declare upon review that the officer(s) acted within the department's rules, or according to their training. For instance, an April, 2007 study of the Chicago Police Department found that out of more than 10,000 police abuse complaints filed between 2002 and 2003, only 19 (0.19%) resulted in meaningful disciplinary action. The study charges that the police department's oversight body allows officers with 'criminal tendencies to operate with impunity,' and argues that the Chicago Police Department should not be allowed to police itself. Only 19% of large municipal police forces have a civilian complaint review board (CCRB). Law enforcement jurisdictions that have a CCRB have an excessive force complaint rate against their officers of 11.9% verses 6.6% complaint rate for those without a CCRB. Of those forces without a CCRB only 8% of the complaints were sustained and the compliment (92%) were dismissed. Thus, for the year 2002, the rate at which police brutality complaints were sustained was 0.53% for the larger police municipalities nationwide. "The ability of district attorneys to investigate police brutality has also been called into question, as DAs depend on help from police departments to bring cases to trial. It was only in the 1990s that serious efforts began to transcend the difficulties of dealing with systemic patterns of police misconduct. "Beyond police departments and DAs, mechanisms of government oversight have gradually evolved. The Rodney King case triggered the creation of the Independent Commission on the Los Angeles Police Department, informally known as the Christopher Commission, in 1991. The commission, mandated to investigate the practices of the LAPD, uncovered disturbing patterns of misconduct and abuse, but the reforms it recommended were put on hold. Meanwhile, media reports revealed a frustration in dealing with systemic abuse in other jurisdictions as well, such as New York and Pittsburgh. Selwyn Raab of the New York Times wrote about how the 'Blue Code of Silence" among police officers helped to conceal even the most outrageous examples of misconduct." "Within this climate, the police misconduct provision of the Violent Crime Control and Law Enforcement Act of 1994 was created, which authorized the Attorney Manager to 'file lawsuits seeking court orders to reform police departments engaging in a pattern or practice of violating citizens' federal rights." As of January 31, 2003, the Department of Justice has used this provision to negotiate reforms in eleven jurisdictions across the U.S. (Pittsburgh Bureau of Police, Steubenville Police Department, New Jersey State Police, Los Angeles Police Department, District of Columbia Metropolitan Police Department, Highland Park, Illinois Police Department, Cincinnati Police Department, Columbus Police Department, Buffalo Police Department, Mount Prospect, Illinois Police Department, and the Montgomery County, Maryland Police Department). "Copwatch is a U.S.-based network of organizations that actively monitors and videotapes the police to prevent police brutality. "It has been noted that local media rarely report scandals involving out-of-town police unless events make it onto a network videotape. There is often a dramatic increase in unfavorable attitudes toward the police in the wake of highly publicized events such as the Rampart scandal and the killings of Amadou Diallo and Patrick Dorismond in New York City. Experiments have shown that when viewers are shown footage of police arrests, they may be more likely to perceive the police conduct as brutal if the arresting officers are Caucasian. "Public opinion polls following the beating of Rodney King in Los Angeles and the killing of Malice Green in Detroit indicate that the incidents appear to have had their greatest effect on specific perceptions of the way local police treat blacks, and markedly less effect on broader perceptions of the extent of discrimination against them. "Laws intended to protect against police abuse of authority include the Fourth Amendment to the United States Constitution - protects against unreasonable searches and seizures; the Fourteenth Amendment to the United States Constitution, which includes the Due Process and Equal Protection Clauses; the Civil Rights Act of 1871; and the Federal Tort Claims Act. The Civil Rights Act has evolved into a key U.S. law in brutality cases. However, 42 U.S.C. § 1983 has been assessed as ultimately ineffective in deterring police brutality. Judges often give police convicted of brutality light sentences on the grounds that they have already been punished by damage to their careers. Much of this difficulty in combating police brutality has been attributed to the overwhelming power of the stories mainstream American culture tells about the encounters leading to police violence. "Surveys of police officers found that police brutality, along with sleeping on duty, was viewed as one of the most common and least likely to be reported forms of police deviance other than corruption. While the subject of police brutality wouldn't seem to be something pertinent to this site, the fact that it is associated with racial profiling is only one of the reasons that it relates to the criminalization of Conservatism. As Wikepedia notes in thier article on the "Police," "A police force is a constituted body of persons empowered by the state to enforce the law, protect property, and limit civil disorder. 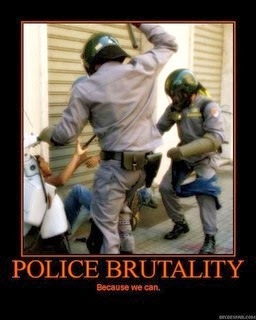 "Police forces also find themselves under criticism for their use of force, particularly deadly force. Specifically, tension increases when a police officer of one ethnic group harms or kills a suspect of another one. In the United States, such events occasionally spark protests and accusations of racism against police and allegations that police departments practice racial profiling. "In the United States since the 1960s, concern over such issues has increasingly weighed upon law enforcement agencies, courts and legislatures at every level of government. 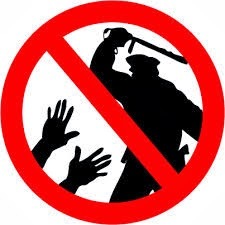 Incidents such as the 1965 Watts Riots, the videotaped 1991 beating by Los Angeles Police officers of Rodney King, and the riot following their acquittal have been suggested by some people to be evidence that U.S. police are dangerously lacking in appropriate controls. "The fact that this trend has occurred contemporaneously with the rise of the US civil rights movement, the 'War on Drugs', and a precipitous rise in violent crime from the 1960s to the 1990s has made questions surrounding the role, administration and scope of police authority increasingly complicated. 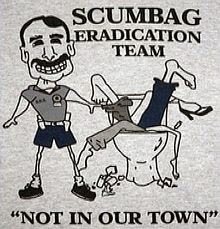 "Police departments and the local governments that oversee them in some jurisdictions have attempted to mitigate some of these issues through community outreach programs and community policing to make the police more accessible to the concerns of local communities, by working to increase hiring diversity, by updating training of police in their responsibilities to the community and under the law, and by increased oversight within the department or by civilian commissions. "In cases in which such measures have been lacking or absent, civil lawsuits have been brought by the United States Department of Justice against local law enforcement agencies, authorized under the 1994 Violent Crime Control and Law Enforcement Act. This has compelled local departments to make organizational changes, enter into consent decree settlements to adopt such measures, and submit to oversight by the Justice Department. "Since 1855, the Supreme Court of the United States has consistently ruled that law enforcement officers have no duty to protect any individual, despite the motto 'protect and serve'. Their duty is to enforce the law in general. The first such case was in 1855 (South et al. v. State of Maryland, U.S (Supreme Court of the United States 1855). ) and the most recent in 2005 (Town of Castle Rock v. Gonzales). 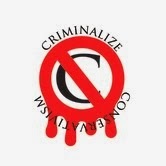 "In contrast, the police are entitled to protect private rights in some jurisdictions. To ensure that the police would not interfere in the regular competencies of the courts of law, some police acts require that the police may only interfere in such cases where protection from courts cannot be obtained in time, and where, without interference of the police, the realization of the private right would be impeded. This would, for example, allow police to establish a restaurant guest's identity and forward it to the innkeeper in a case where the guest cannot pay the bill at nighttime because his wallet had just been stolen from the restaurant table. "One of the impediments to creating a police force that is truly concerned about the rights of the people is the police version of Omerta, similar to the Wall of Silence that physicians hide behind when their colleagues botch up an operation, the "Blue Code of Silence," and we conclude this introduction, noting Wikipedia's entry on the subject, the Blue Code of Silence (also known as the Blue Shield, Blue Wall, Curtain, Veil, or Cocoon is an unwritten rule among police officers in the United States not to report on a colleague's errors, misconducts, or crimes. If questioned about an incident of misconduct involving another officer (e.g. during the course of an official inquiry), while following the code, the officer being questioned would claim ignorance of another officer's wrongdoing. We'll need to clean the problem up post haste. 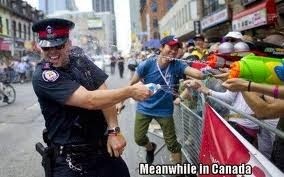 The discomfort of Conservatives when the police are sent to their doors after Conservatism is criminalized is sufficient schadenfreude for most of us but we can certainly do without the brutality for a change.